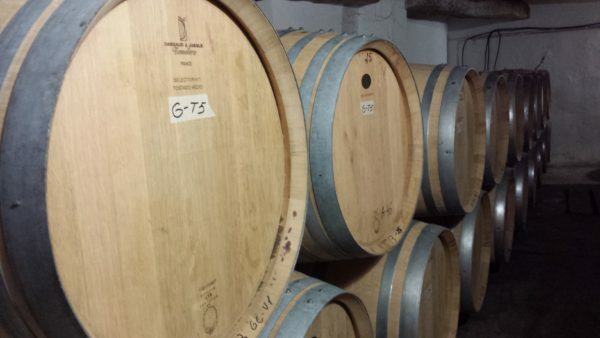 On a wine tour of Spain last fall, Amber visited almost every region, except Montsant. 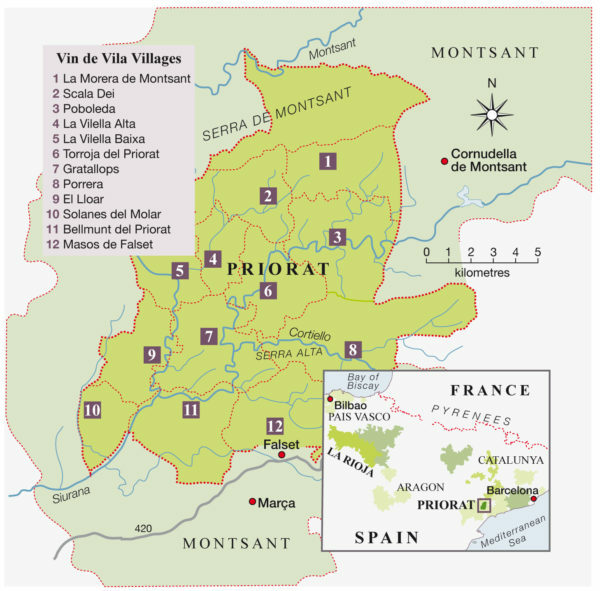 For no other reason than a lack of time, Montsant was bypassed for its neighbouring region, Priorat. Although sharing a border within a very small area, the two wine regions have many micro-climates between them. 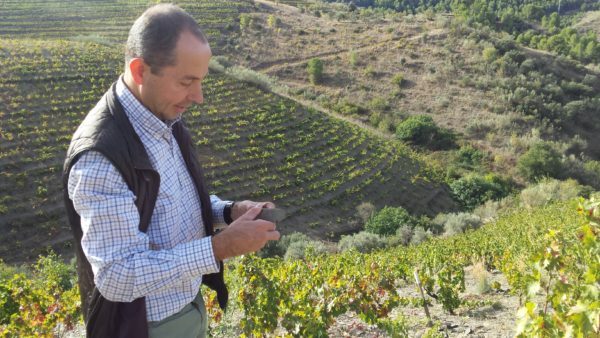 Xavier Peñas, General Manager of Gran Clos and owner of Celler Sant Rafel, explaining the unique slate soils of Priorat. 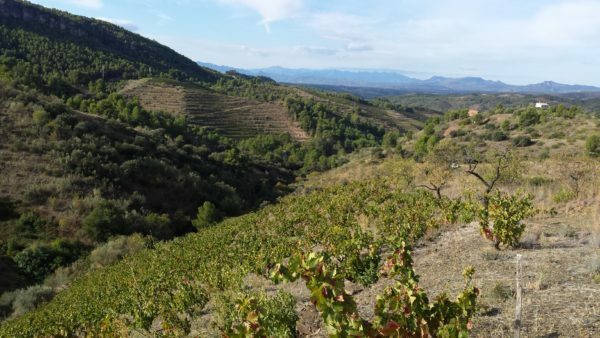 Hosted at Gran Clos del Priorat by General Manager, Xavier Peñas, we were treated to a vineyard tour of steep, slate covered hills (llicorella soils), barrel tasting in the tiny cellar and sampling of the vintages that never made it to Canada. The very limited production and distribution of Gran Clos have appeared on Tannic and sold out instantly (stay tuned for a limited release of large format bottles)! Priorat is known for its beauty and structured wines and we were not disappointed. Barrel room in the cellar of Gran Clos (above). Rolling hills of Priorat, from a Gran Clos vineyard (below). Once back in Calgary, we received samples of Xavier’s own wines, Cellers Sant Rafel, which he produces from vineyards in Montsant. Montsant is west of Tarragona city and the region was formerly a sub-region of the Tarragona wine region (since 2001 has been recognized as its own DO). Montsant almost entirely wraps around the region of Priorat, with vineyards of both Priorat and Montsant sometimes just meters apart. Wine has been produced here for centuries, although only within the last decade has it made international markets pay attention. Montsant is similar to Priorat in that they both are characterized by rolling hills, slate soils and grow mainly Grenache anad Carignan. Similar to other re-discovered Spanish wine regions, like Bierzo, the ancient vines and wine making history of Montsant, and firstly Priorat, have been awakened. International wine makers and solid and consistent vintages attracting critics, have brought the spotlight. Ironically, after traveling to Spain in search of new, exciting wines, Celler Sant Rafel was only discovered once back in Canada. The Joana line, named after Xavier and Pilar’s daughter, consists of the fresh and addicting Joana and structured and spiced, Joana Selecció. Both wines are brand new to Canada, and are being exclusively featured in all September WineCollective packages. Join WineCollective by August 31 to make the cutoff for September’s delivery and you will receive one of our new Joana selections! JOANA AND JOANA SELECCIÓ ARE NOW AVAILABLE IN STORE! The limited remaining inventory of Joana will be available in the WineCollective online store September 15th! Use the coupon code: MONTSANT5 for $5 off your store order of Joana wines!